I’d booked the 0930 train (though I could take an off-peak train I liked) to Kings Cross and it was mostly empty. I had a fortuitous bit of luck when selecting my seat and I knew it was going to be a great day. 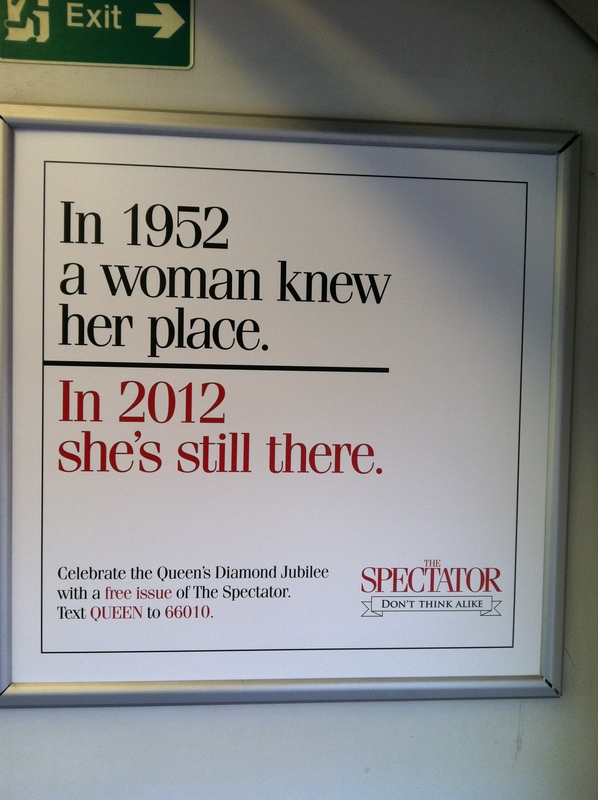 Since I arrived in the UK, I’d seen these fantastic posters for The Spectator, referencing the Diamond Jubilee, but I’d never been in a position to take a picture of it. Then on Sunday and Monday, I noticed there was a different poster advertising the magazine and I’d feared that I’d missed my chance. But as I randomly choose my seat, there was the poster! If it had been the end of the day, I definitely would have tried to pull it down to take home with me, but I didn’t want to carry it around all day. The 0930 stops at more places than the 0920 (probably the reason why most folks take the earlier train), but I was in no rush. The train filled up a bit more the closer we got to London Kings Cross, but I still had most of the back of the car to myself. I was able to cross the Hammersmith and City line off my list as I traveled to Paddington station to pick up the next train in my journey to Windsor. 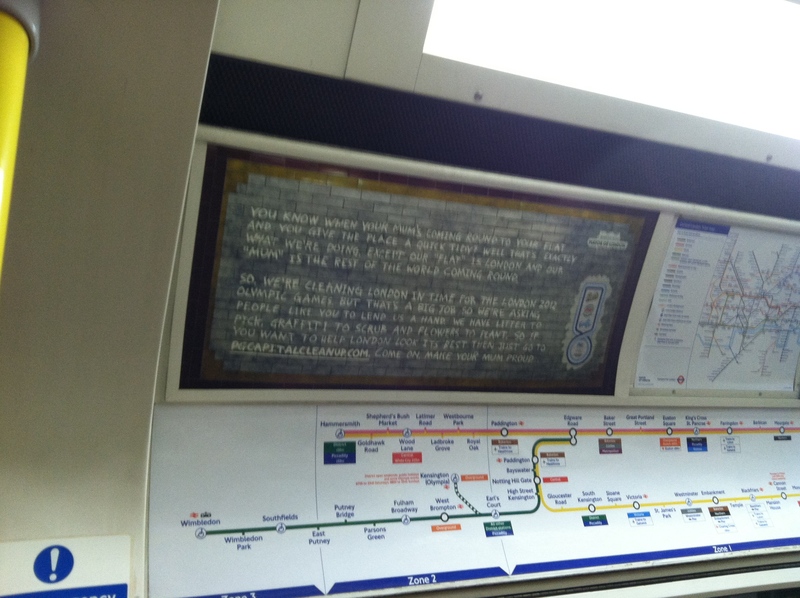 The only Underground lines I did not ride were the Waterloo & City line and the London Overground – not too shabby! Arriving at Paddington station, I needed to use the loo. I re-discovered the joy of the pay toilet as it cost 30p to enter the loo. I did actually have 30p in the denomination needed, but the turnstile in which I put the coins did not work. Luckily, the lady ahead of me gave me 20p to go with my extra 10p and I was able to use the other turnstile to enter. I explored Paddington station for a bit, looking at the Paddington Bear merchandise cart, but ultimately not spending £10 ($16) on a stuffed Paddington for my nephew. I looked for the Paddington Bear statue for a photo, but didn’t find him. I hopped on the First Great Western train to Slough (though the final destination was listed as something else and if I had not done my obsessive-compulsive itinerary, I would probably still be wandering to find the right train). I managed to find a seat, but of course, it was next to an eccentric gentleman who was traveling with his cat. The train seemed to stop at every tiny town between Paddington and Slough, but we finally made it. 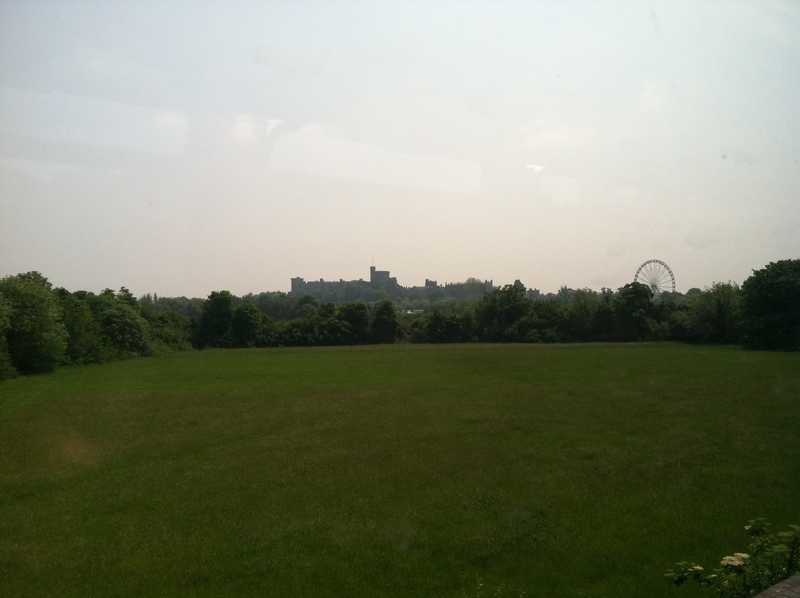 I alighted with many other tourists who waited about 10 minutes for the next train to Windsor. A two-carriage train acts as a shuttle between Slough and Windsor & Eton Central station. The short journey via the short train was a great introduction to this magnificent castle. We came around a corner, and all of the sudden, the trees faded away and BAM, there was the Castle standing high on the hill! I alighted with the rest of the tourists, making my way through the tiny train station. Well, it’s basically a platform long enough for the two-carriage train and that’s it. There wasn’t even a station master around either time I went through, so I guess you better have a round trip ticket (not that anyone checked my ticket either). It’s hard to tell where the train station ends and the shops begin, but I made my way out to the street. The Castle is literally across the street from the train station, and the sidewalk was swarming with tourists. 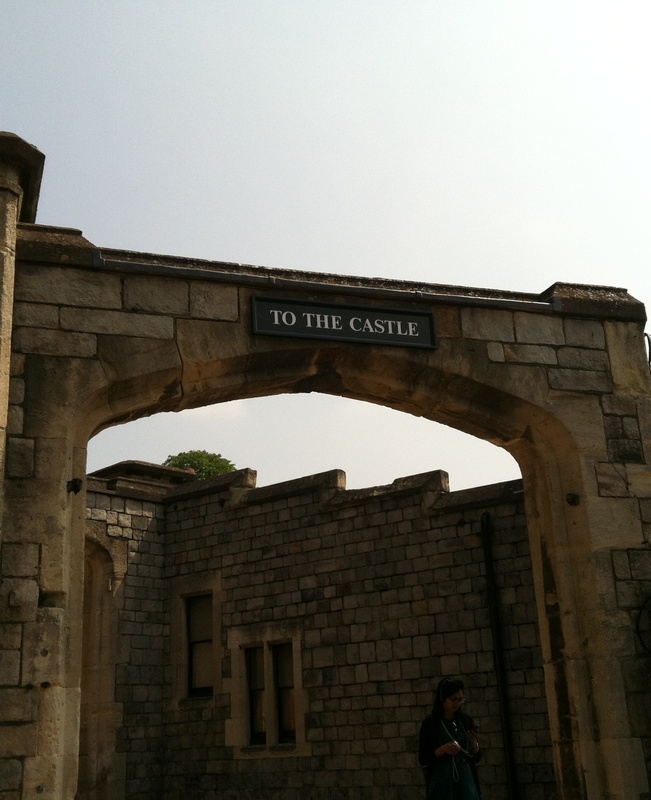 Initially, I wasn’t sure where to actually enter the Castle, but after my attempt to enter through the exit gate, a friendly guard pointed out the LARGE SIGN that says WINDSOR CASTLE ENTRANCE behind us. Oops! The website had indicated that late morning/early afternoon was a great time to arrive because most of the tour groups would be done at that point. I arrived at 1215 and had no queue to get my ticket, no queue for security and no queue for the audio guide. Thank you, Windsor Castle website! The FREE audio guide was fantastic! Unlike the one we used at the Royal Pavilion, they gave you a strap and headphones, so you could hang the device around your neck and listen via headphones instead of holding it up to your ear all afternoon. Prince Charles introduces us to the audio guide and Windsor Castle, which was a little unpleasant for me (he’s one of my least favorite Royals). 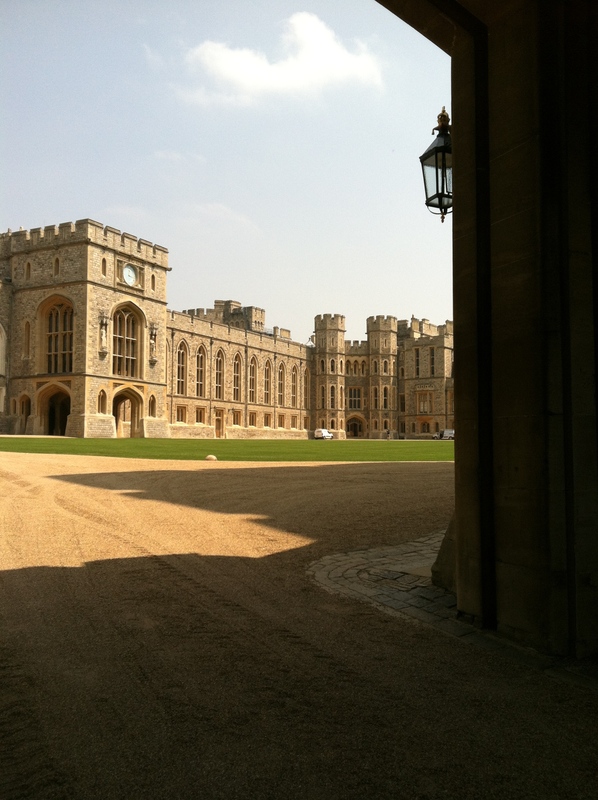 However, I quickly fell in love with the Castle and all thoughts of Prince Charles were quickly out of my head. The Castle wasn’t empty by any means, but it was definitely not crowded and I was able to view the different stops on the tour without having to elbow people out of the way. The audio guide does a great job of setting the scene and the Castle itself is simply magnificent, so after the disappointment of Kensington Palace, I was in Royal heaven all afternoon. 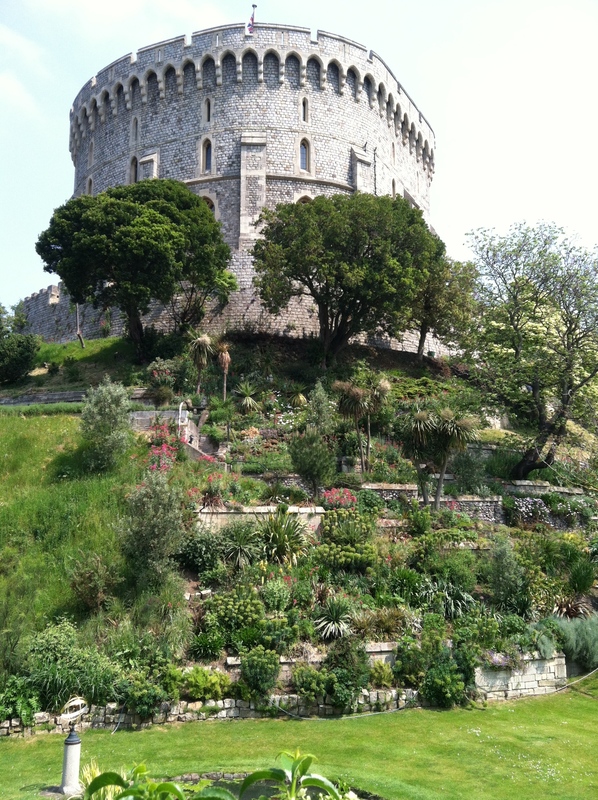 The garden moat was in full bloom and the Round Tower is even more impressive in person than it seems in the photos. 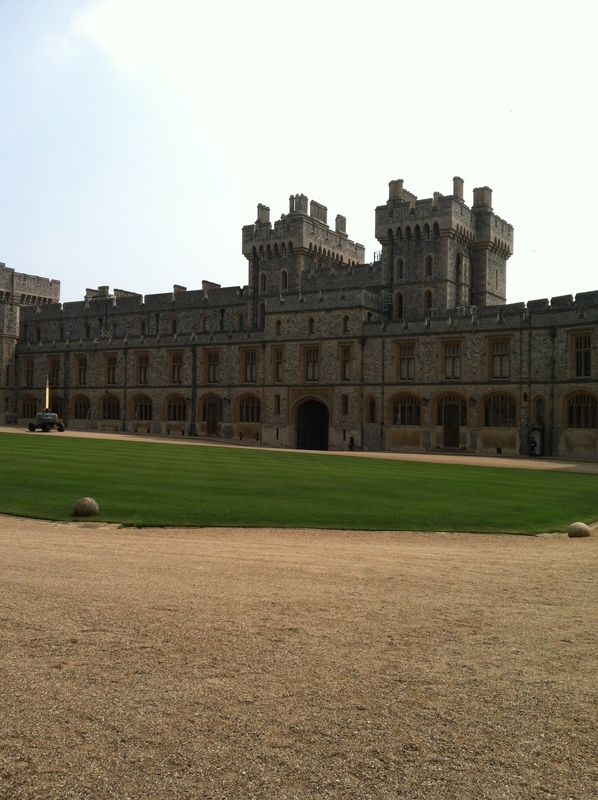 Whenever I get the chance to go back to Windsor, I plan to conquer the Tower, while Katia tours the kitchen. I waited a short-ish line to enter the State Apartments and Queen Mary’s dollhouse. The dollhouse was sufficiently impressive (it’s like 10 feet tall and has working lights, etc), but if I had to do over again, I would have skipped straight to the State Apartments. Visitors wind their way around three sides of the dollhouse and people don’t always enjoy and move at the speed I would like, but there is no way to get around anyone as it is a small room. And of course, there is no photography allowed inside, so of course, more postcards were purchased at one of the many gift shops. One of my favorite parts of the interior tour was the Diamond Jubilee photography exhibition, 60 Photographs for 60 Years. There were so many photos of the Queen smiling! My favorite photos involved the young Princes; there’s a fantastic one of the Queen reviewing William’s unit of officers, where she’s smiling and he’s smirking delightfully. The best part of the actual State Apartments, however, was St. George’s Hall. The grand scale of this room is hard to describe to those who have not been inside, but it is magnificient. It is part of the Castle that was destroyed by fire in the early 1990s, but the restoration is amazing. In addition to being architectually lovely, this room is also home to the Coats of Arms of every member of the Order of the Garter, the highest Order of Chivalry, dating back to 1348. On the walls around the windows is a list of every single member in the order in which they were inducted. 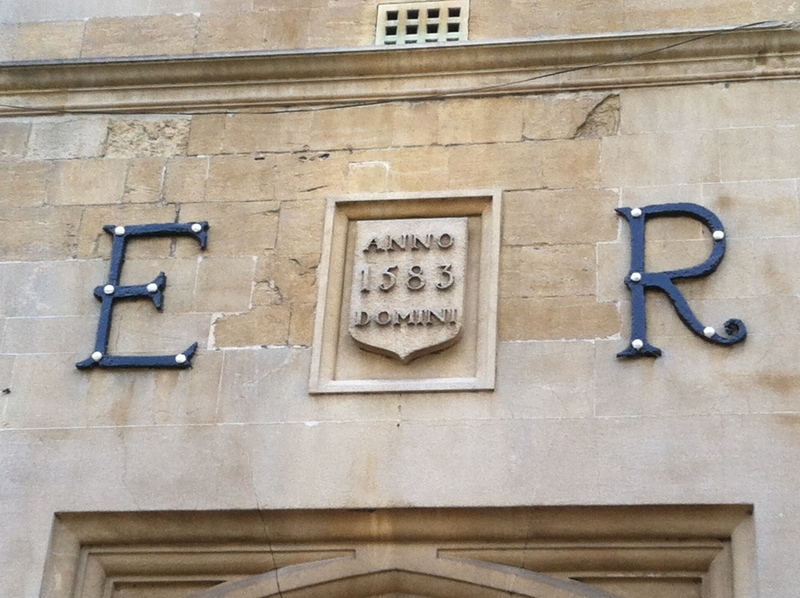 The number next to their name corresponds to the Coat of Arms posted on the walls and ceilings of the Hall. If a member was removed from the Order, their Coat of Arms was removed and replaced with a white shield to remind everyone else that they were naughty. Prince William is one of the newest inductees and his Coat of Arms is #1000. I spent far more time looking for it than I probably should, but was not able to find it. I was too embarrassed to ask one of the guides in the room to locate it for me, not wanting to be “that girl,” though I’m sure they deal with that request at least once a day. From the State Apartments, I wandered through a couple gift shops before stopping to take photos of the Quadrangle from this side of the gates. 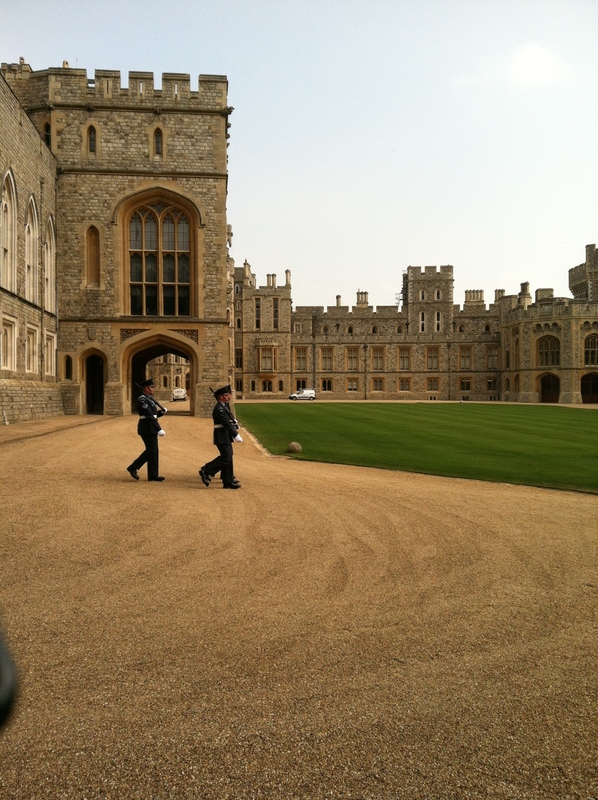 As I took the photos, a quartet of soldiers enter the quad and marched across. 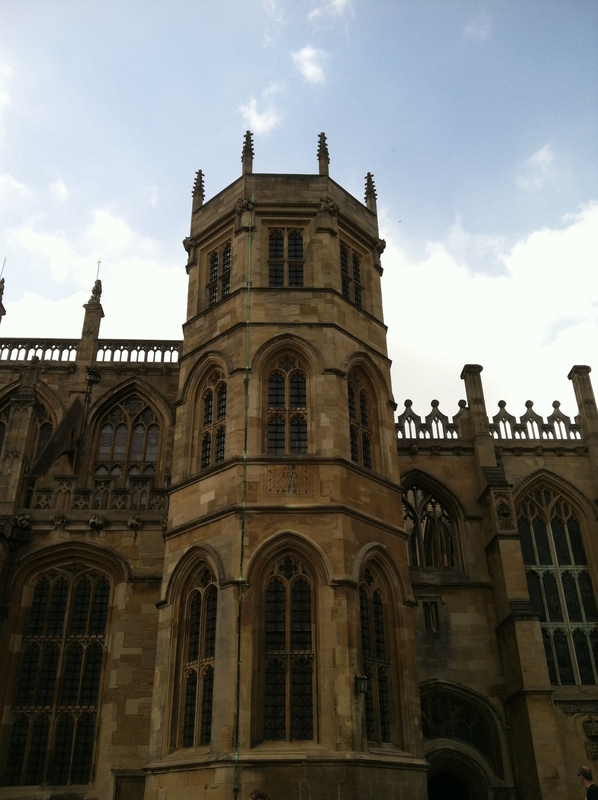 I took a few photos, then decided to head down to St. George’s Chapel. I stopped to take another couple photos and all of the sudden, they were on top of me. I quickly moved to the side, remembering the warning from the audio guide that the Castle is a working home. St. George’s Chapel is the home of the Order of the Garter and it’s also the final resting place for many members of the Royal Family. The architecture is breath-taking as is the history. At one point, the audio guide pointed out the balcony closest to the altar in the Choir; it belonged to Katherine of Aragon, first wife of Henry VIII. My trip started to come full circle as I viewed the beautiful memorial to Princess Charlotte and her stillborn child that I’d heard about at the Royal Pavilion in Brighton. One of the chapels holds the tombs of King George VI and Queen Elizabeth, the Queen Mother as well as Princess Margaret. The tour mentioned that the Royal Family regularly has services here on the holidays, reminding me that while they are larger-than-life historical figures to me, they are simply the Queen’s mother and father. I made sure to follow Brian’s advice and walked over the tomb of Henry VIII (apologizing to Queen Jane in my head, as it’s not her fault she’s buried there too!) on my way out. All too soon, it was time to leave the Castle. I exited the gate correctly, nodding to the guard who’d directed me earlier (and he was kind of enough not to remember me!). I wandered through a few cheesy tourist trap shops, fighting my urge to buy more William and Catherine souvenirs. I looked in vain for a “Mind The Gap” sign to replace the one I lost in the Detroit airport in 1995, but it was not to be. I also looked for a rose-covered tea shoppe to have cream tea, but was not able to find it either. I walked down the longest high street, stopping in Dorothy Perkins (but not buying anything) and not stopping in Zara (as I didn’t trust myself not to buy anything). I had my last lunch at EAT, sitting at a table outside and watching the people go by. 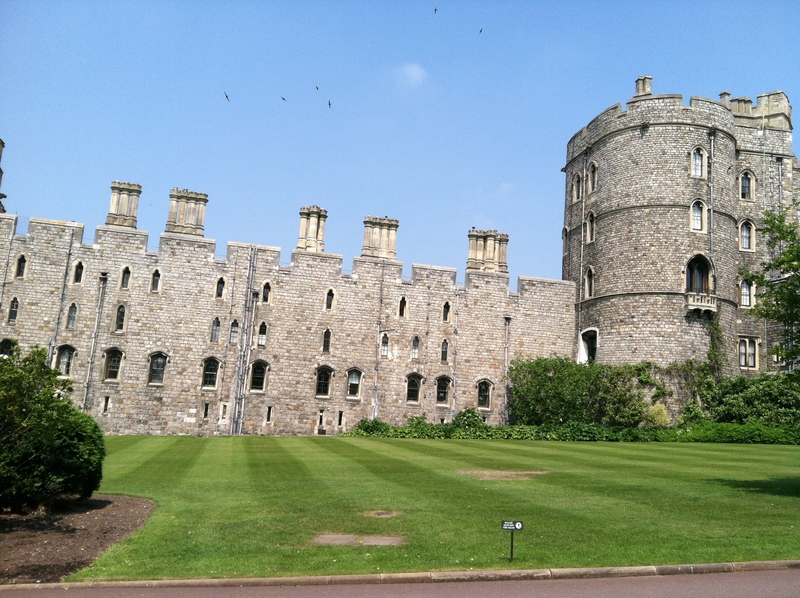 I could have easily spent the rest of the afternoon and evening, exploring Windsor and nearby Eton; it was, by far, the most relaxed I’d been all trip and it felt absolutely divine. I grabbed the 1630 train back to Slough and managed to snag a seat on the 1644 train to London Paddington, which was a feat since the previous train had been cancelled. Arriving at London Paddington, I again looked for the Paddington Bear statue, but it was not to be found. I slipped back on the Underground to Kings Cross without the photo. Once at Kings Cross, I was about an hour too early to use my offpeak ticket to Cambridge, but there was a train leaving in about 15 minutes that would get me in about the time I would be leaving London. I waited impatiently in the ticket line, paying almost as much for the upgrade as I did for the ticket itself, but I got a peak ticket to Cambridge. I sprinted from the ticket office to Platform 6, hopping on the train just as the doors were closing. As I watched the countryside go by, I started to get a little misty about my last train trip to Cambridge of the vacation. We arrived in Cambridge just after 1900 and I was hoping to snag the 1905 bus to Katia’s flat. Unfortunately, I wasn’t the only one rushing to get off the platform and a gentleman commuter opened his bike up on me. Chain grease got all of my arm and watch, though luckily not my clothing and the bruise was pretty nasty. It took me a few minutes to get my wits about me again and I missed the bus. The air was turning a bit chilly as I waited for the 1925 #1 to Katia’s. It was the first time since my morning in Cambridge a week earlier that I wanted a coat or at least pants. I got back to Katia’s about 1945, tired and sore, but totally happy. She needed to finish her thoughts/writing for the day, so I cleaned myself up and prepared for dinner. We stopped at Katia’s first choice on the quayside, but it didn’t appear to have any tables available. We ventured further down to Prezio, but it was also full and had street musicians playing outside. We came back to the little Italian place and after a short wait, we were seated just on the walkway, overlooking the river. This provided much entertainment, including a group of guys who were taking turns punting while drinking their way through a cube (24 cans) of beer. The food was lovely and the atmosphere couldn’t be beat. I filled Katia in on my Windsor adventures as we savored our last evening together. We decided to walk a bit before having dessert, heading to one of Katia’s favorite bakeries. Unfortunately, it was closed and after a couple more false starts, we ended up at Wildwood. 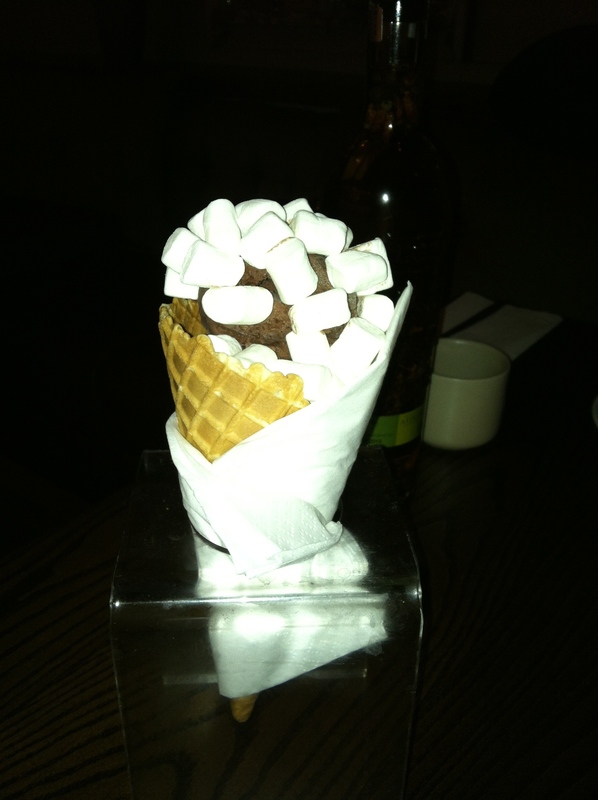 I got another chocolate ice cream cone with marshmallows, making sure to photograph it this time for posterity. After dinner, Katia wanted to take me on one final long walk around the town, but the cold wind on my bare legs was not a good combination. It was still lovely to take the short way back to Katia’s flat, a now familiar route, crossing the river and passing the same stores and homes. Katia finished her writing and commenced the re-packing of my suitcase and carry-on. With some creativity (and carrying a lot on), I managed to get all the souvenirs, bags, tickets, brochures, books into the suitcase with all my dirty clothes and shoes. I was still a bit worried that it might be over weight, but I figured I’d cross that bridge at Heathrow the following morning. Once I showered and got ready for bed, it was almost midnight. We’d planned to watch a fabulous British movie, but had downgrade to an episode of Gavin and Stacey. Unfortunately, Katia had trouble getting the episode to load and the longer I laid on the air mattress, the heavier I could feel my eyes becoming. Finally, I had to admit defeat and succumb to sleep. Run 5K: Week Five is a Wrap!